RSS or email subscribers: Can’t see the video? Click through to view it on the web. Version 1 of the Moneta dress features a bodice that is fully lined. 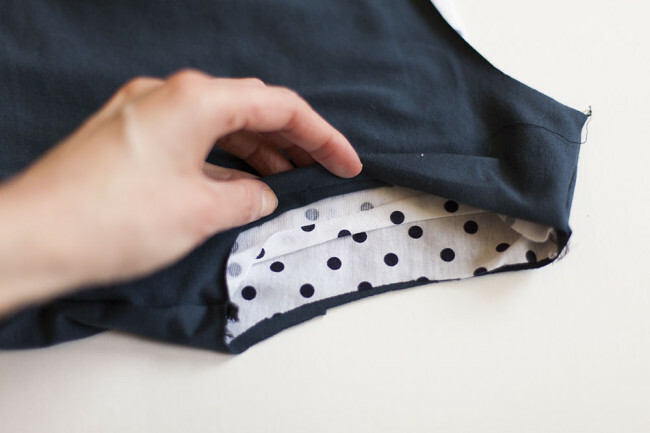 If you’ve struggled before with lining sleeveless tops or dresses, we have a little trick to show you today to get a perfectly lined, clean-finished armhole, all by machine. The secret is not sewing the armholes all in one go. You sew the front armhole, then the back armhole separately. 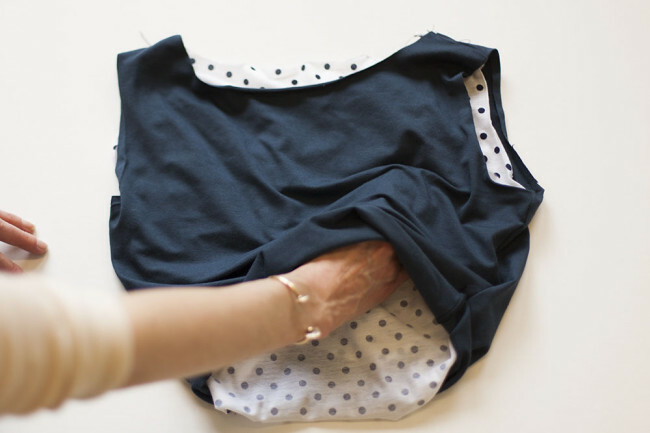 The video and photos below show this with the Moneta dress, which is made from a knit fabric and sewn with a serger, but you can also use this trick on a woven garment with your standard sewing machine. Watch the video above and follow these steps to try it out. With right sides together, start by stitching the shoulder seams and side seams together on both the bodice shell and bodice lining. Turn the shell right side out. Place the lining inside the shell, with wrong sides together. 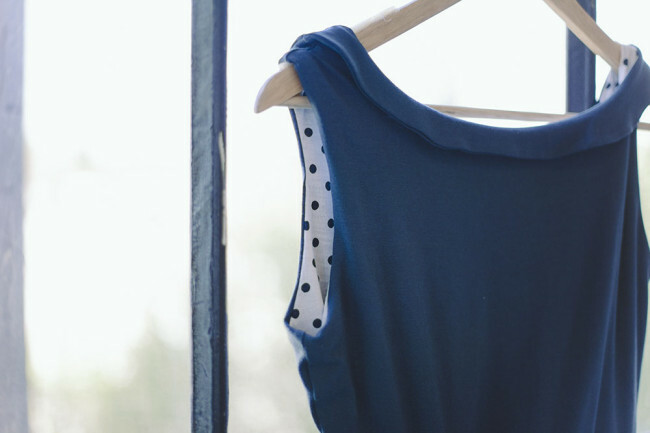 Note: For Moneta, the neckline is left open because a collar is sewn to it later. If you also want to clean finish the neckline at the same time, you can do that before step 3. Place the shell inside the lining with right sides together. Stitch the lining to the shell around the neckline. Turn the lining inside the shell, with wrong sides together, then continue to step 4. Turn the seam allowance under at the front armhole. Press if you find it necessary. You only really need to turn the seam allowance under on part of the armhole. Reach between the lining and shell layers and grasp the two seam allowances of the front armhole. Pull them out through the waist. With right sides together, stitch the shell to the lining along the front armhole. Stitch from the side seam to the shoulder only, don’t try to sew the entire armhole. The armhole is now finished along the front. Let’s move on to the back. Just as before, reach between the lining and shell layers and grasp the two seam allowances of the back armhole. Pull them out through the waist again. 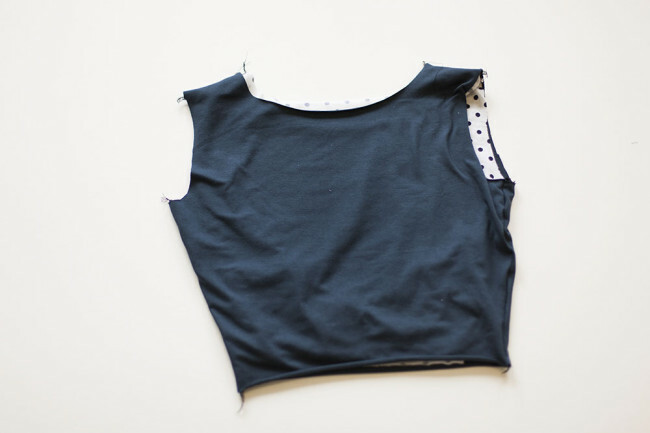 With right sides together, stitch the shell to the lining along the back armhole. Stitch from the side seam to the shoulder only, meeting the stitching of the front armhole. 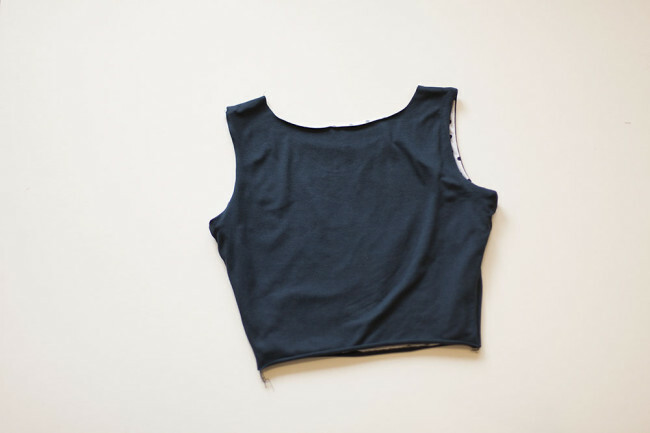 Complete the second armhole in exactly the same way, and you are done! this is genius! very clever. Love the music…. Also love the very smart, very clever technique. Thank You! Mainly because you wont be able to get the bodice back the right way around! The fabric will be twisted around the seams weirdly. Hard to explain, but if you’re making one try pinning or basting all the way around and try and pull it out the right way – impossible! This is so timely! I was just about to try making a reversible knit dress, and this trick for finishing the sleeves/neckline is going to come in handy for sure. Thank you. 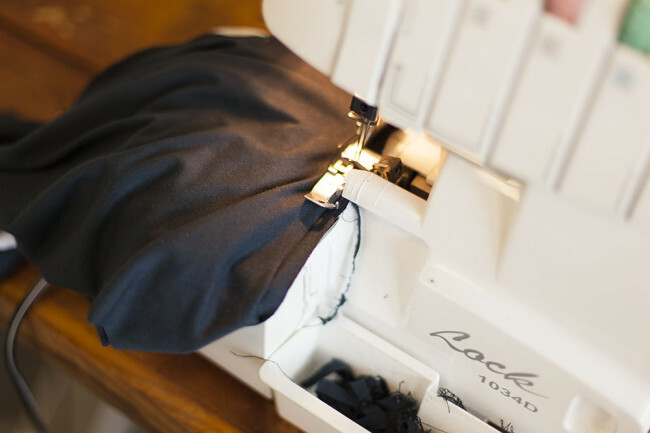 You make sewing look so easy! I like to sew reversible garments but struggle because I can’t figure out the mechanics of things. I was wondering if you next have a tip for sewing the neckline with a nice clean finish as well if I wanted to turn this into a reversible top? Usually instructions make you pull one side through the open shoulders of sleeveless top… Thank you. Hi Amy! If you are sewing the neckline clean finished as well, I like to do the neck seam first. It’s simple to just sew the entire neck opening, and then do the above technique to the armholes. I like doing it this way so my pieces are already attached. I’m a huge fan of clean finishing, both from sewing ease, to how it looks on the finished garment. Thank you so much. I printed out this tutorial and will be trying it for sure. This is one of the best video tutorials I have seen. Every step easy to see and follow. Thank you! Fantastic!! I sew needed that! Thanks so much for posting this, am totally amazed and can’t wait to try it. It’s not an easy one to explain for sure! I think I was making guttural noises and hand motions while trying to explain it more than once. 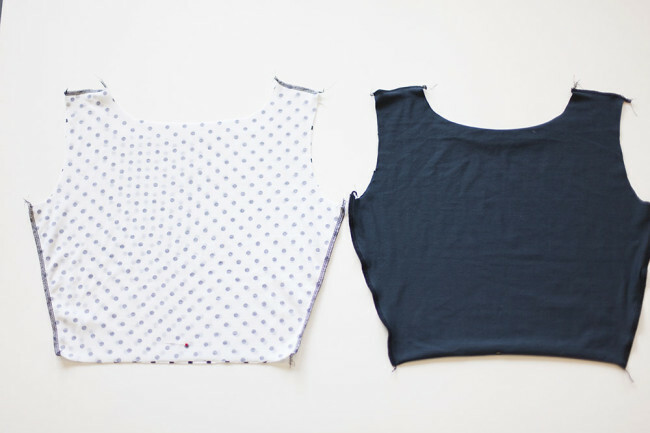 What is the benefit of sewing the armhole in two sections versus just sewing it in the round? I’m attempting this as my first knit pattern this weekend and am curious. Although I’m terrible with linings so I’m a bit nervous! If you attempted to sew the armholes in the round all at once you wouldn’t be able to turn the garment right side out and it would be a huge mess! Trust me, I tried. What a great technique. I’ve done it a different way, getting the same results, that is, without having the shoulders of the lining as the last part as they always direct you to do in the major pattern companies’ instructions. My way is much more difficult, so now I have your way….woohoo! Is this technique shown in the book too? It isn’t – but it is covered in the Moneta pattern. Just to elaborate a little on what Kristen said, this isn’t in the book beause it’s not really specific to knits. You can do it on wovens too! Thank you for this! Can’t wait to give it a try. When making my sleeveless version I was really confused at first, and then “a-ha! brilliant”. I’ve previously used the technique in the Rooibos dress for sleeveless dresses but I usually forget and sew up the side seams first, and then have to do some unpicking. brilliant! I just received my pattern and love it. I am making a sleeved version first with some gorgeous liberty jersey I ordered with it from Susan (sewbox) but I will try this for sure when I make a sleeveless one later on. Just need to find fine jersey for the lining…. hopefully! Love the book too, BTW. I can’t get my brain around this. Why do you need to put the two pieces together as they will be when they are finished and then turn them the wrong way round to sew? Can you not just press the seam allowances, put them right sides together then sew the front seam followed by the back seam? I was also having a rough time putting it together in my head. So I grabbed a muslin bodice that I had in my sewing room, cut a piece to act as the lining, and then followed along with my hands while watching the video. I think the reason you do it this way, instead of just piecing rightsides together like normal, is to avoid having to turn things rightside out again, which you can’t really do, because there is no opening to pull through. At least my not-so-good-at-spatial-relations-brain could not figure out how I’d turn it rightside out! It would really have helped if the video used fabrics that are obviously different inside and out, too. Well, the polka dot is printed, so it does look pretty different on the wrong side, but not the outer fabric. Unfortunately, I think the only knits that would look noticeably different on each side would be printed. I thought using two printed fabrics would be visually pretty confusing. Maybe french terry would have worked though, now that I think about it! We’ll be doing a sewalong on the Mabel soon. In the meantime, you may be able to find some tutorials online for doing a kickpleat like that. But we’ll be covering it too! I tried this on last week on my first Moneta and it is brilliant. It made me feel so clever!!! Thank you soooo much for the video. It really helped! 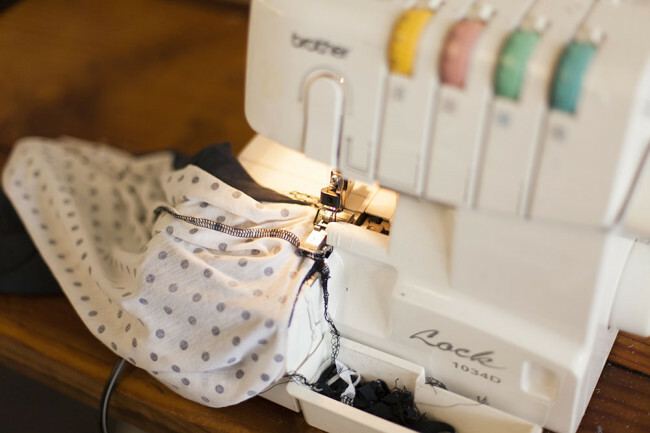 The extra support you give us seamstresses is one of the many reasons I love Colette Patterns! Thank you! Wow! That is no “little” trick as you say. That’s a big trick, and the answer to a problem I’ve struggled with for years! Thank you so much!!! And just in time for summer dresses! Hooray! This combination of a photo tutorial with the video tutorial is perfect! I’m sure that the video took a lot more time but it is so helpful. Thank you for putting this together. Your tutorials allow me to be more adventurous in my sewing. Hi! Thanks so much for sharing this tip. I’m still confused about one thing, though. The lining for Moneta was trimmed back 1/8 inch around the neck and armholes. This means that the seam allowance for the shell is 3/8, but the lining is 2/8. So I’m wondering…how do I match those up? Do I match them on the seam allowance fold? Or match them by their respective edges? Or do I (for some reason) still apply a 3/8 seam allowance to the lining, rendering all my spatial gymnastics moot? You are trimming for what is called “turn of cloth.” This means that you want the lining piece to be slightly smaller than the outer piece, so that the seam turns to the inside. You do not need to change the seam allowances, because then the lining would no longer be smaller. All you have to do after trimming is match up the raw edges and sew the 3/8″ seam as usual. So no gymnastics needed! As a novice sewer I tried altering a dress with a lining last evening. This lead to wondering about a time I might start a garment that required a lining. You make lining a top look incredibly easy. Not yet for me, but I will give it a try the next opportunity. The video was really helpful, thanks. 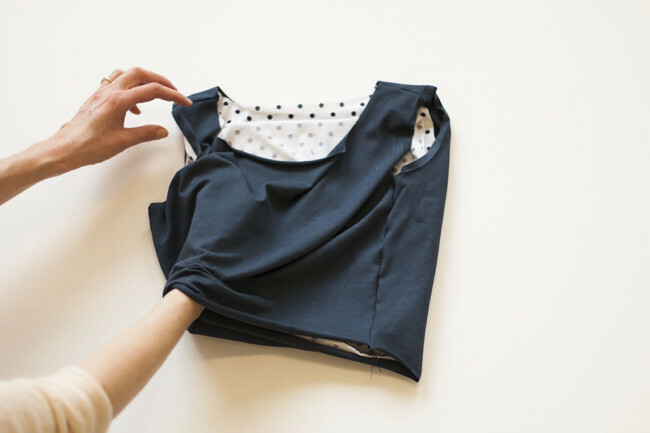 The moneta booklet says try adding sleeves to version 1. I’m trying to wrap my head around that. 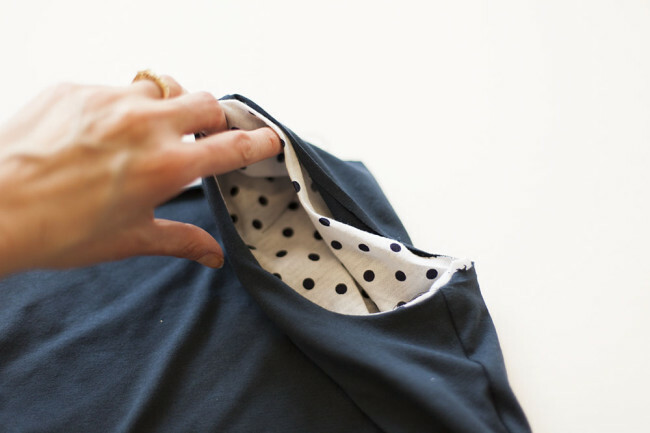 Would you sew the sleeve flat to the shell and then use this technique? Or can you not line the bodice if you add sleeves? If you’re adding sleeves, there’s no need to clean finish the armholes like this. You can just put the lining inside the bodice (wrongs ides together) and sew the sleeve in as if the bodice and lining are one unit. Easy peasy! Hello, I was wondering whether I need to stabilise the shoulder seams with clear elastic? It’s optional, but a good idea if you are using fabric with a tendency to stretch out, such as 100% cotton or bamboo. I find pressing seam allowance on jersey really tricky, could you use a fusible stay tape on the edges before turning them to help stabilise the knit and fold/press? You could, definitely. You really don’t need to fully press them or even have the pressing hold for very long, since it’s really just to help you fold the edges under so you can grasp and turn.